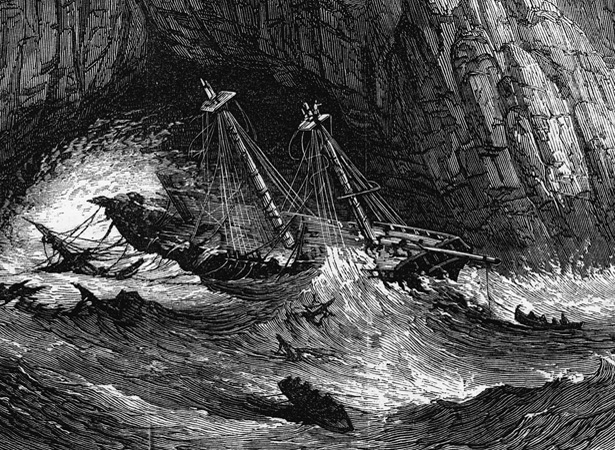 On 14 May 1866 the General Grant, sailing from Melbourne to London, hit cliffs on the west coast of the main island in the subantarctic Auckland Islands. Of the 83 people on board 15 eventually made it ashore at Port Ross at the northern end of Auckland Island. This was the most critical moment of our lives. If the last match failed, starvation and perhaps cannibalism were to be our lot.’ One of the men dried the last match against his body. ‘I saw his hands tremble as he looked for a dry stone on which to strike the remaining match. He struck it with trembling fingers and the flame caught the dry grass. We all uttered, “Thanks be to God”: it was the most fervent prayer I ever said.’ The fire, once lit, was never allowed to expire. To survive the castaways grew potatoes and caught wild pigs using iron hooks. They also domesticated pigs and goats. After nine months, four of the crew set out in a small boat for Bluff, more than 500 km away. They were never seen again. Another survivor, David McLelland, died of illness before the ten surviving castaways moved to nearby Enderby Island. They were finally rescued by the whaling brig Amherst in November 1867 after having survived 18 months on the subantarctic islands. We have 8 articles, 1 comment related to Wreck of the General Grant .